I am definitely a girl with a sweet tooth and my sweet tooth is usually requires a daily indulgence in chocolate. However, occasionally I crave butterscotch. Last week one evening such a craving hit me and I knew automatically I wanted butterscotch oatmeal cookies. 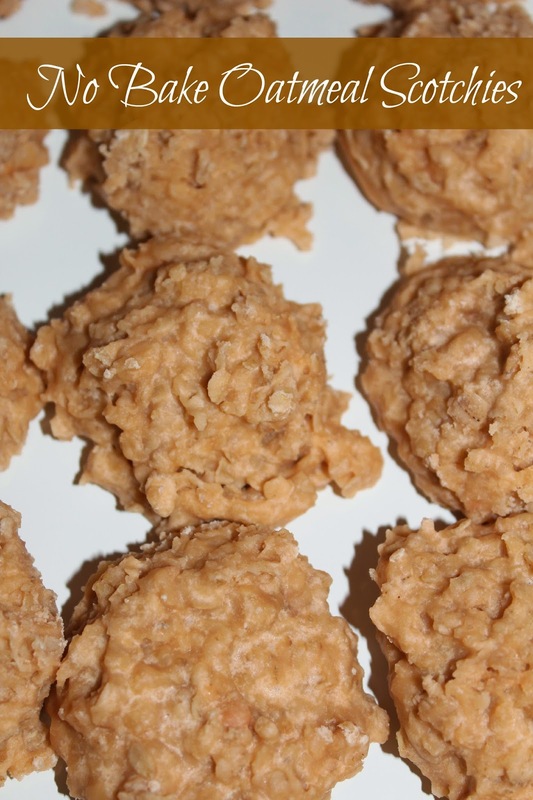 After I checked to find that I had the necessary butterscotch morsels in my kitchen I knew I didn't have the patience to wait for butter to soften to make my usual go to butterscotch oatmeal cookie recipe. Instead I decided to give a no bake version a try and they turned out delicious. I snacked on these cookies all week. I love using this cookie scooper to obtain uniform cookies. 1. In a large saucepan over medium heat add sugar, milk, and butter. Bring to a boil and boil for one minute. 2. Remove from heat and quickly add the vanilla extract, salt, and butterscotch morsels. 3. Stir for a 2-3 minutes. The morsels will not melt completely. 5. Drop by tablespoon onto parchment paper. I use this cookie scooper (it's my favorite) in medium. 6. Allow to set and cool. Store in airtight container. I have a sweet tooth too and these look particularly tempting with the butterscotch. Thanks for the recipe! I've been seeing a lot of these no bake cookie recipes lately and they seem so easy, not to mention the cookies look delicious!! I think I might try this recipe this weekend. Thanks for sharing!! You have a lovely blog <3 this looks amazing!! I'm running an Oasap giveaway on my blog, I'd love if you'd participate! Aw! My husband used to come over all the way back in middle school and make no-bakes with me! I'm grabbing this recipe to make with him this weekend! Thanks! I have never made a no back cookie before. Going to have to give this a go one day. All girls are, no matter what they tell you. You had me at "no bake." Totally making these! I loveeee butterscotch AND oatmeal! They look absolutely amazing! I will have to try. M.Mae. I need to find out what butterscotch is and then I'm definitely trying this recipe!! wow, no bake? i'll have to remember this!! Now, that's my kind of cookie!